The Alaskan Malamute was the freight locomotive of the high north. Malamutes have played an important role in history; they were used in expeditions to Antarctica, The Gold Rush, World War 1 and 2, and most famously known in the Serum run from Anchorage to Nome. The Alaskan Malamute Breed, as we know it today is around thanks to Arthur T Walden, Milton and Eva Seeley who developed the “Kotzebue” strain, Paul Voelker the “M’Looot” strain and Robert Zoller the “Hinman” strain. The Alaskan Malamute originated in the hash environment of Alaska and is believed to be the oldest breed on the Noth America continent, and the breed of dog longest associated with man. For four thousand years or more the Mahlamuit People crossed the Bering Strait though Artic North America to Greenland and back. They faced many lifestyle changes as their environment changed. During the summer they moved inland to fish and hunt while winter brought them to the coast to hunt for sea mammals. They used these dogs to haul their possession back and forth, the amount of dogs used depended on the weight onboard the sled. The Inuit people believed that hungry dogs were better workers, they were only fed every second day and the non working dogs every third day. 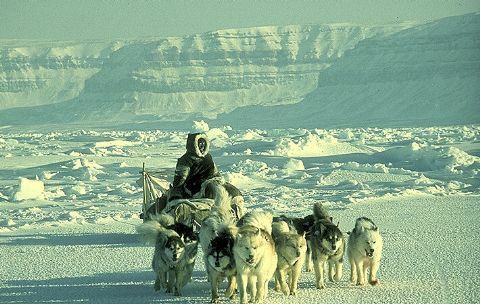 The Inuit's advised the Artic explores that the dogs could be worked up to five days without food, but would soon die, due to the long expenditions they undertook. To stop the dogs from being hurt from dogfights or biting. The Inuit people filed down or pulled out the dog's teeth. Inuit people fed their dogs small cut up pieces of seal or walrus skin, because of their teeth being removed. Prospectors of the 1896 Gold Rush discovered the need for sleds and dog teams. The Alaskan Malamute was a prized and respected dog and many people would pay a high price for a team of dogs. The demands almost lead to the extinction of the breed, with people cross breeding to produce hybrids of the Spitz type. The Spitz breeds were dogs breed to work in extremely cold conditions and were working dogs only. They retain a thick double-layered coat, designed to protect them frm the harsh cold weather. Breeds range from the small Japanese Spitz to the large Alaskan Malamute. Other breeds in the Spitz variety include the Samoyed, the Husky and the Japanere Akita. The inbreeding of the spitz breeds can account for slight variation in conformation of the modern day Alaskan Malamute. In World War 1, (1914) the French Government needed a way to get food to their troops. The French contacted the Nome Kennel Club for help, the Alaskan's responded by sending 450 dogs with their sleds and harnesses, along with two tons of dog food. When the Was ended many of the troopers took the dog's home with them. This resulted in the spread of Alaskan Malamutes throughout certain parts of the World. in World War 2, (1939) many Alaskan Malamute were used as mail carriers. They were used to delievered mail parcels, food and supplies to remote communities not connected by roads or accesible by air, bring these dogs back in their element once again. After the War many of these dogs were used on an expedition to Antarctica. Due to extreme weather conditions a command was given to tie the dogs to ice floe and to destory them by an explosive charge, ceasing their lives humanly rather than leaving there to starve to death. Racing of sled dogs took hold in New England in 1921, with a race being held between two sledders with a three-dog team. The first International Sled Dog Race in 1922 took over 3 days held in Berlin, New Hamphshire it was won by Arthur Walden. He later became the first president of the New England Sled Dog Club. In January of 1925 a doctor from Nome diagnosed his first two patients suffering from Diphtheria. Diphtheria is a disease that causes a mucus build up restricting the throat and the airways and can result in death. The native population had already fallen by a measles epidemic in 1900, followed by influenza in 1919, where whold villages died. The call was sent out for the vaccine for this deadly disease, as their stocks on antioxin were inadequate. Ninety-one Malamutes, Huskies and hybirds were used to transport the Serum through Alaska's worst winter from Nenana were the train was bogged down by snow through to Nome. This trail usual took two weeks, however these teams completed the run in only five days. A statue of a lead dog that ran the last two legs of the Serum run, known as "Balto" stands in New York Central Park to commemorate this event. The Alaskan Serum run follows the Iditarod mail trail, this trail is the source of the name for today's sled races, also called The Last Great Race. It is held each year in February from Anchorage to Nome a distance of over 1 600 km. A recent film production that protrays The Last Great Race is the movie Snow Dogs. ARTHUR T WALDEN played a prominent role in introducing Eva Seeley to the worl of Alaskan Malamute. When Eva Seeley went to the Worchester Carnival to experience a sledding ride. Arthur Walden happed to be one of the sledders with the two teams of dogs at the Carnival giving rides. Eva was in Walden's sled. Suddenly, the dogs saw a cat and took off. he hust his hand and was quite anxious about his passenger. His concern, it turned out was unfounded the diminutive Eva was absolutely thrilled. It can be said that a good "Kotzebue" bred into any line will improve the progeny of those dogs, they have good head, muzzle, eyes and a wonderful expression. Their conformation in body is more uniformed and is general around 23-25 inches at the withers, and weights around 40 kilos. they were less aggressive and much easier to control, Kotzebue" strain are mostly wolf grey. PAUL VOELKER developed another strain of malamutes although he did not have his malamutes shown or registered his puppy buyers did. The American Kennel Club reopended it registration books for a short time during the 1960's allowing the M'Loot strain of malamute to be registered. M'Loot strain of Malamute was 35 inches at the withers and weighed over 90 kilos, they were the biggest and strongest sled pullers. The "M Loot" dogs were long legged and lacking muzzles. The "M Loot" strain has more variation in colour and coats, their outer coats are longer, and woolier, this long coat was incorrect for extreme weather conditions. Their colouring is light grey and white, to black and white, sable and white, and red and white, and a few dogs white all over. Overall the "M Loot" is a heavier boned dog, they were bigger, fl;ashier and more impressive. This strain of dog however was prone to fighting and difficult to handle unlike the "Kotzebue" strain. The two terms "Kotzebue" and M'Loot" are used to describe the genetic heritage of our present day malamute. Robert Zoller is responsible for the recognition of breeding these two strains together in the 1950's and 1960's this strain is called the "Hinman" strain. these two differest strains above go to different extremes some times, it seems there were two separated breeds. Most of the Malamfutes araound today are of the "Hinman" strain, this is from registered breeders, breeding to produce the perfect dog. History for this article was taken from the Alaskan Malmute Social Club information. This was written by L Boulton, I would like to take thanks to the information that was provide to me by the above. Written as a assigement for Tafe. Added to website out of Love for this beautifull breed.